Clinton County News	» In the photo avove, Clinton County Judge/Executive Richard Armstrong signs a proclamation declaring November as Hospice and Palliative Care Month for Clinton County, Kentucky. 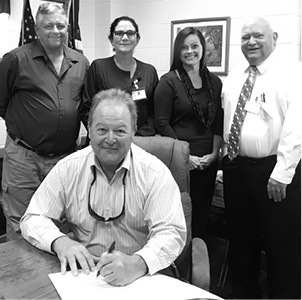 In the photo avove, Clinton County Judge/Executive Richard Armstrong signs a proclamation declaring November as Hospice and Palliative Care Month for Clinton County, Kentucky. Looking on are, left to right, David Bolin, Hospice System Administrator, Beth Adkins, Hospice Case Mgr., Beth Bertram, Hospice Senior Nurse Mgr., and Keith McKim, Hospice Chaplin.